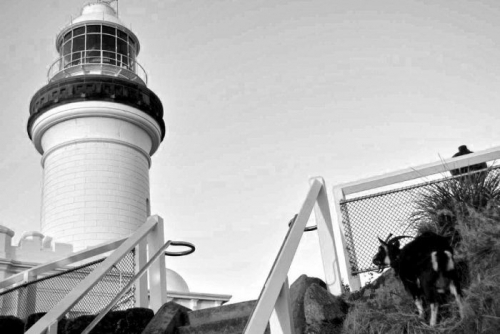 What happened to the famous goats of Cape Byron lighthouse? Wategoat, contemplating a covert mission on the Cape Byron Lighthouse clothesline. Lone Goat Gallery's name was inspired by Wategoat, the elusive and last remaining goat of a small herd that used to roam the Cape Byron headland. Wategoat disappeared in 2013, not long before the gallery was founded, and her fate and wherabouts have long been the subject of rumour and debate. "The Cape Byron Lighthouse goats are now but a memory, but one has been recently honoured in the small, one-room museum sitting at the base of the lighthouse. There you can find a portrait of a renegade goat named Wategoat, who in 2013 evaded capture after a rescue mission was launched by local emergency crews. Apparently the goat was unwell and got stuck on a ledge. However, as rescue teams scaled down the cliff and neared the goat, Wategoat jumped off the ledge with a bleat and fled, making national news". Wategoats' disappearance ensured her place in local folklore, becoming a symbol of dissent and community division over change and development, but her fate has remained a mystery, perhaps until now. Elloise Farrow-Smith of ABC North Coast decided to take the story by the horns, shining light on the origin of the goats, and uncovering the fascinating and controversial theory that Wategoat was in fact a covert agent and ..."a protest goat"! Read on for Wategoat's Mysterious Exit!